For over forty years, Annabel Trends has been making quality home linen, kitchen napery and accessories. Their Australian-designed products are made with care and will look wonderful in your home. Bumped your head? Bruised your knee? Got a headache? Hungover? Don’t resort to a packed of frozen peas from the fridge…get an Ice Works Chill Pack instead! Not only does it look much nicer, but it has a whole bunch of uses, and it’s better to rest on your face and head than tonight’s dinner. With its 1960s tattoo printed exterior, you’d likely never know that this Chill Pack could be filled with ice cubes unless we told you. Just remove the lid, fill the pack two-thirds full with ice, and close it all up again. 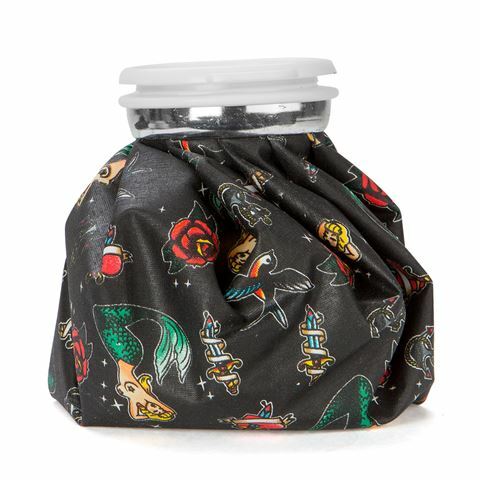 The water-tight lining keeps the pack dry as you nurse that migraine or bump on the head. Annabel Trends. It was trending before Twitter came up with the phrase. Exterior made from polyester-cotton blend. To use, fill the pack two-thirds full with ice cubes and secure lid. Use on any area of the body that needs soothing. After use, drain and allow to air dry before replacing cap.